Mulch with well-rotted organic matter in spring. Prepare a large hole by breaking up the soil and adding plenty of well-rotted organic matter. Stake trees for the first 3-4 years. Healthy medlar trees will bear for decades. Can harvest in autumn before the fruits are fully ripe or else leave until they ripen if there is no danger of frost. Fruit must first be ‘bletted’ before eating raw. To do this, leave them in a cool place until they turn dark red-brown and become soft. 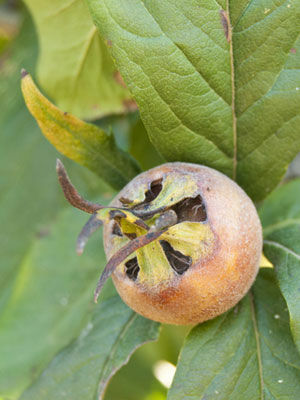 Medlars are naturally astringent, like persimmons.